Two very exciting things happened this weekend. First, Step-Sister #1 and her longtime boyfriend, who recently became her fiance, got married! The change doesn’t seem like that big of a change to me because he’s been around for so long he’s already been like part of the family to me. Regardless, the official-ness is nice and I welcome him to the family! Crazy kid, he’s stuck now. At least he kinda knows what he got himself into. She’s here! After what’s felt like YEARS of anticipation, the newest addition to our little family is finally with us! We decided to register (with the AKC) her name as Caliber, but we’ll call her Callie. 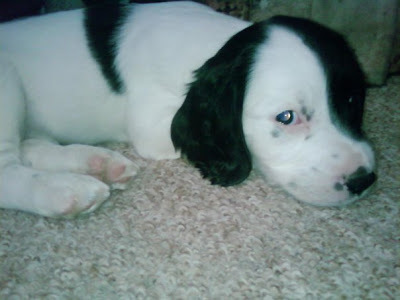 She’s a purebred English springer spaniel and was born on Sept. 10, which makes her about 6.5 weeks old. As of her Thursday visit to the vet, she weighed 6 pounds, 9 ounces. And, as you can see, she is the. most. adorable. thing. you’ll. ever. see. Her interests include sleeping, eating, drinking (loudly and messily), peeing, pooping, biting, clawing and running. We bought her a squeaky pheasant toy (Pete’s going to make her into one hell of a bird dog) that she seems to love. Her and Velvet have been getting along really well, except that Velvet isn’t always as dominant as I’d like her to be, so Callie gets all tooth-y and claw-y and practically bites Velvet’s ear off. It’s a good thing she has so much hair. Callie is really brave and, like the previous owners told us, quite a ham. She’s already taken up stalking Velvet and pouncing on her (she also does this with our feet, hands, faces…), much like she’d do with quails, ducks or pheasants in the field. She’s not afraid of half the things Velvet’s terrified of, like plastic bags, rolled-up newspapers, the laundry or sudden movements in general. And the few things she has been a little afraid of, the fear has manifested itself more as hesitation than real terror, so she’s been curious though slightly cautious about those things (like the lawnmowers and windshield wipers). 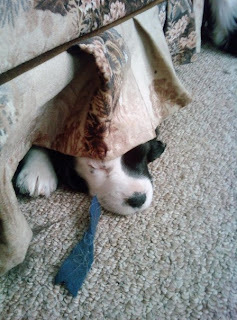 She loves sleeping under things and when we can’t find her in the house she can usually be found either under the bed or couch.